Written during Israel's late exile, the book of Joshua gives a somewhat idealized recollection of Israel's early exodus. This story describes early Israel's loyal choice of God as if that was an instant, wholehearted decision, with no struggle or doubt. In this instruction, Saint Paul affirms some social arrangements common in his day, but revolutionizes others, and grounds them all in our relationship with Christ. In prior verses from John 6, Jesus has said some things that not all can accept. His words today put that rejection in its proper context. "with its emphasis on the conquest and division of the land, is to show the fidelity of God to the promises made in the past to the patriarchs and Moses--particularly the promise of the land. One of the chief themes found in the Pentateuch [the five books prior to Joshua in the Hebrew Scriptures] is the promise of land. That promise is fulfilled in the Book of Joshua so as to engender in the people a trust in God's promises. Now Israel in the midst of the Exile, can trust in God's continuing care and presence, and trust especially that the promise of the land remains in force. At the same time, obedience to the Law is important lest, having been forgiven and brought back to the land, Israel again bring down upon her head such destruction as she is now experiencing." Serve the gods of their ancestors, who lived "across the River" before Abraham, many generations back. Serve the gods of the pagan Amorites whose country they are occupying now. Serve the Lord, who has liberated them from Egypt and brought them back, fulfilling the ancient promise to Abraham. They can be indecisive no longer. deserves a very slow, solemn proclamation. Joshua is throwing down the gauntlet here; the stakes don't get any higher than this. Make it sound ultimately serious. Then make the people's response sound lively and enthusiastic. That's tough because they don't just say a hearty "Yes! Amen!" They recite a whole creed. Unless you work at it and rehearse, you may sound like a contemporary congregation reciting the Nicene Creed in autopilot mode. Instead, try to capture the newness of this all to the historical participants. They're only a generation away from slavery. They're inexperienced nomads wanting to settle down. They've re-adopted a long lost religion. Something new and exciting is afoot, and they're in it, hearts and souls. The Historical and Theological Background: Early in this letter Paul praises God for finally revealing the long secret plan of world salvation: In Christ, the Gentiles have finally come to enjoy the favor of God long reserved for the Jews. The two groups are united, now, in Christ. And while the Jewish Law doesn't save anybody, The Gentile people had lived for generations without the Law's excellent moral guidance. They're due for an ethical upgrade, if we may use a term so anachronistic. Now there were plenty of other teachers instructing people about morals and domestic life. What makes Saint Paul's teaching distinct is how he places his doctrine in the context of the mystery of Christ. It's not simply that wives should be obedient and husbands should be loving. It's that both these "stances" express the relationship of the Church to Christ. What's the relationship of Christ to the Church? What did Christ do for the Church originally? What was his purpose in doing so? By what means and of what "spot or wrinkle" did Christ cleanse the Church? What does Paul mean by "the bath of water with the word"? What's the bridal imagery behind Christ's regard for the Church? Proclaiming the Passage: All that is more important than the teaching about domestic relations (the words "Christ" and "Lord" appear seven times in eight the sentences). Your challenge is to proclaim this in such a way that your listeners get the bigger picture. But the lector can contribute, too. First of all, be sure you can recite the verses with a straight face. If your spouse will be in the congregation that you serve as lector, talk over the passage and these Lector's Notes, and rehearse the reading at home with your spouse listening. If you are lector in an intimate assembly like a college Newman Center, or where congregants hold all their opinions strongly, especially positions about gender relations, you may want to provoke some special preparation for everyone. What you want to prevent is anyone snorting, laughing or groaning because they're surprised by the assertion "Wives should be submissive to their husbands." Better to get the liturgy committee and presider to defuse the issue with a brief teaching before mass, or a concise introduction that you as lector can deliver before the reading. 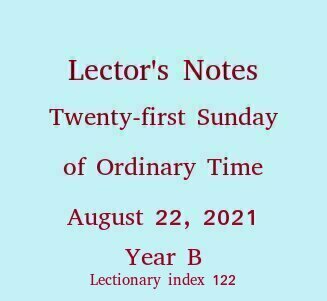 If you're reading Lector's Notes more than a week before the 21st Sunday of Ordinary Time, you're probably ahead of everybody else. Start talking to them today. 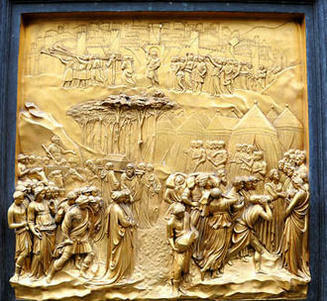 Scenes from the book of Joshua. The artist is Lorenzo Ghiberti (Italian 1378-1455). The work is part of his east door of the Battistero di San Giovanni, Florence, Italy. The photo is from the travel blog of Ferrell Jenkins, who generously says, "The photos we publish may be used by teachers and ministers in various types of educational presentations, including PowerPoint and handouts, as long as credit is given for the source of the photo."